He's always been a good boy. But now they know he's a hero. For Louie the dog's family, there's never been any doubt he's a good boy. But even they were astonished to learn about just how good a boy he really is. In fact, now he's being called a hero. 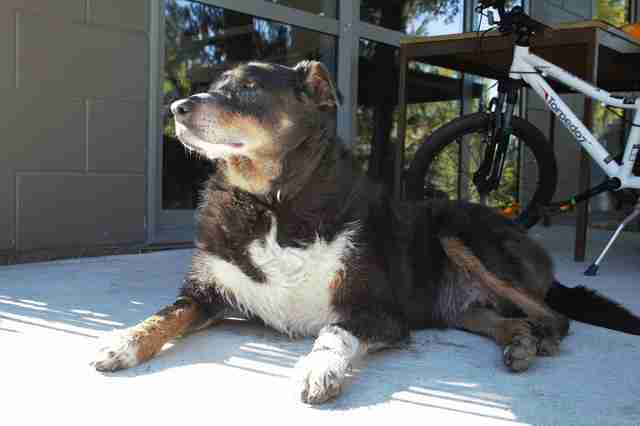 Louie is a sheepdog who lives with Marolyn Diver's parents in New Zealand. For as long as she's known him, the sweet pup has always loved heading out on little adventures through the farmland surrounding their property, but his wandering ways have waned with age. At 12 years old, as his body has slowed and his senses dulled, Louie seems to prefer keeping closer to the house nowadays. So, when the old dog disappeared one day recently while Marolyn was in town visiting, it was a cause of some concern. "My mother was a little grumpy as she had thought he had stopped his wandering," Marolyn tells The Dodo. "We worried he might forget where his home was." What they didn't know at the time was that Louie was off saving a life. After an entire afternoon had passed with no sign of Louie, his family was relieved at first to see him ambling back toward the house — but then they noticed a note had been attached to his collar. Marolyn's first reaction was alarm. Was it a warning? Had Louie caused trouble, or crossed paths with the wrong person? "He looked so exhausted, and had basically just collapsed," Marolyn says. "We were concerned someone might have hurt him. But after reading the note I felt complete and utter relief, then my heart melted." "Louie is the hero of the day," the note read (corrected for spelling). 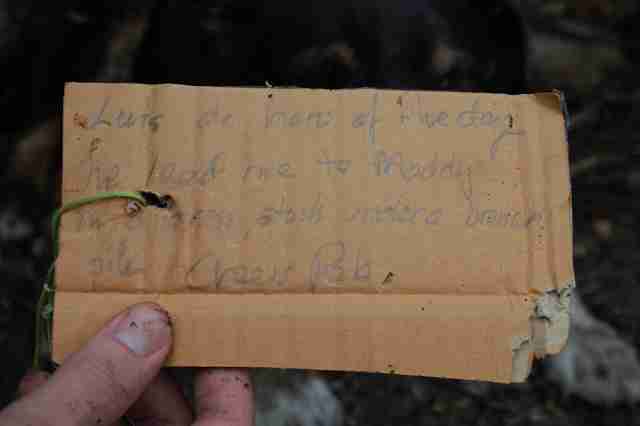 "He led me to Maddy in distress stuck under a branch pile. Cheers, Rob." Rob is a farmer who lives about a mile away, and Maddy is his dog. Marolyn and her parents called him to learn more about what had happened. Turns out, Rob hadn't been able to find Maddy earlier that day as he headed off to run some errands in town. 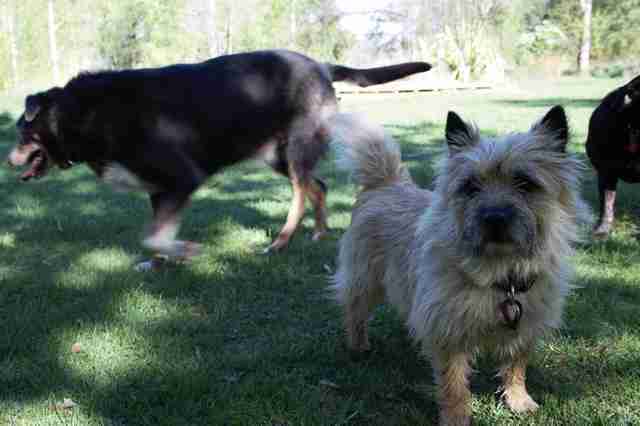 When he returned home, however, Louie was there, seeming very insistent on being followed. Eventually, Rob agreed — and sure enough, Louie led him directly to a pile of wood where Maddy had gotten trapped. "Rob said he was 100 percent sure that Louie knew what he was doing, and getting Rob to Maddy was his one pure focus," Marolyn recalls. 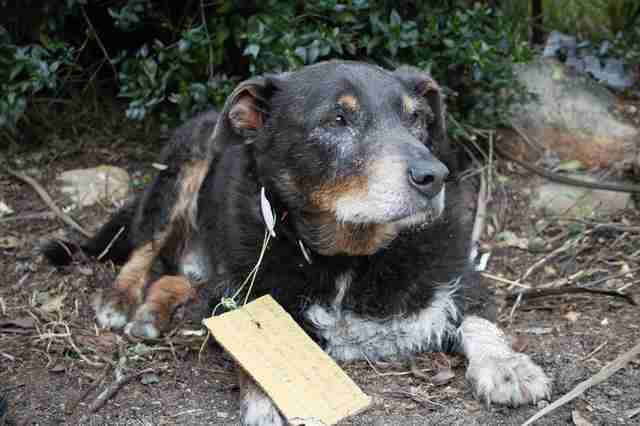 "Once he found her, Louie helped Rob dig her out, pulling at branches, digging out the ground. 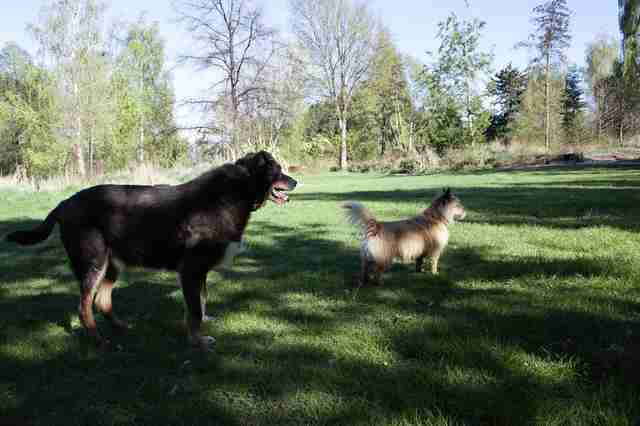 Rob said the second she was free both dogs ran to a nearby pond and jumped into it exhausted and drinking water. He then gave Louie a huge handful of dog biscuits as a thank you. He knew Louie might get in trouble for being late home, so he thought he would write a small note to explain his absence." Thanks to Louie, Maddy was OK. Sadly, all the energy Louie had expended to ensure Maddy was rescued had apparently taken its toll. 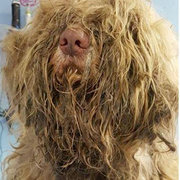 Though Louie did manage to make it home afterward, he was now in poor shape. "That night we were very worried about Louie. He could hardly walk and looked terrible," Marolyn says. "We were scared that he might not make it through the night." But then he got a visit that lifted his spirits. 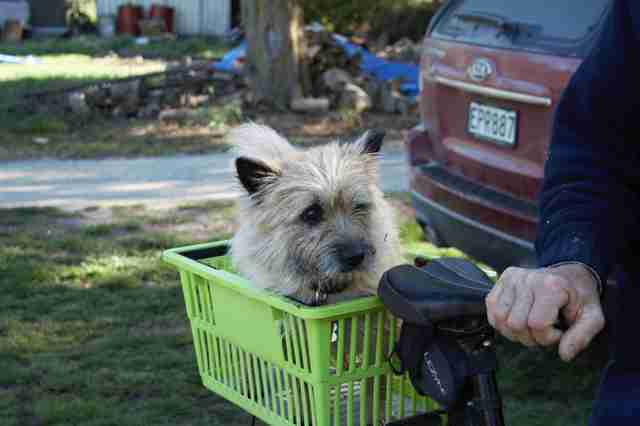 "The next morning Rob came over on his bike with Maddy in a wee basket in the back," Marolyn says. "Louie perked up and was back to normal." Marolyn and her parents have always adored Louie, whom they'd rescued from an animal shelter when he was still a puppy — and more than a decade later, their love for him is still growing. This recent act of heroism is just the latest reason why. "It has changed the way I look at him. And I think my parents feel the same way," Marolyn says. "I'm so proud of him." Maddy, no doubt, is too.